J. Zavadlav, M. N. Melo, S.J. Marrink, M. Praprotnik. Adaptive resolution simulation of an atomistic protein in MARTINI water. T.A. Wassenaar, K. Pluhackova, R. Böckmann, S.J. Marrink, D.P. Tieleman. Going backward: A flexible geometric approach to reverse transformation from coarse grained to atomistic models. 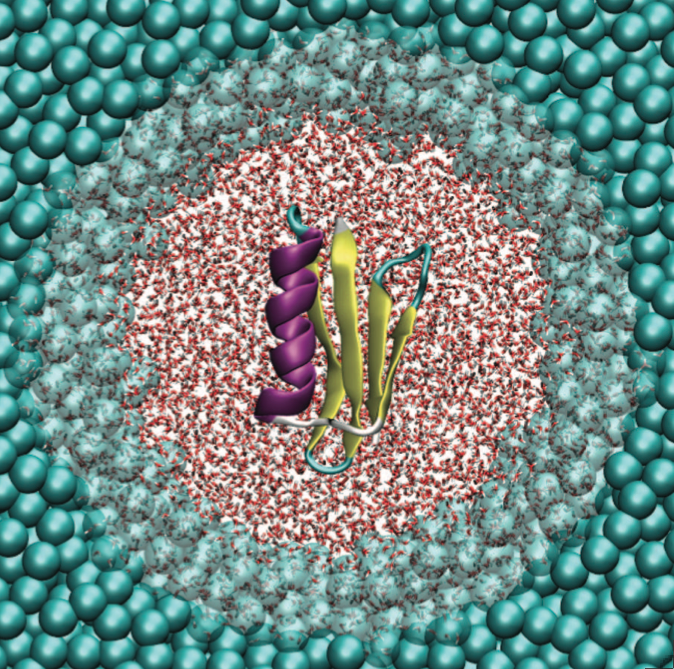 Review online: "Coarse grain modelling of protein–protein interactions"
Try out the next flavor of the Martini force field for lipids: Dry Martini. Still without olives. In this version of Martini, water beads were completely removed from our simulation boxes. We adapted the interactions between beads by slightly tweaking the interaction levels and tuning some bonded parameter to reproduce the properties observed with the standard Martini force field. The new force field developed has been shown to nicely reproduce bilayer properties for a large variety of lipids. Dry Martini is so far available only for lipids. A couple of small membrane proteins have been shown to perform equivalently compared to the regular Martini model; adaptation for proteins in (dry) solution is still in progress. Curious? Excited? Download the parameter files and run your first Martini simulations without aqueous solvent! Review online: "The power of coarse-graining in biomolecular simulations"
There was a major update on the cgmartini.nl website on August 22nd. Due to the update and a move to a new server, a handful of forum posts between August 20-22 were lost. We are very sorry for the inconvenience.